My grandfather, Frederick Alexander Barnett (Master Brewer) came to the then Shrewsbury and Wem Brewery from Farnham Brewery in 1916. He was the brewer here for 20 years until his death in 1936 when Mr Fenn-Wiggin came in. 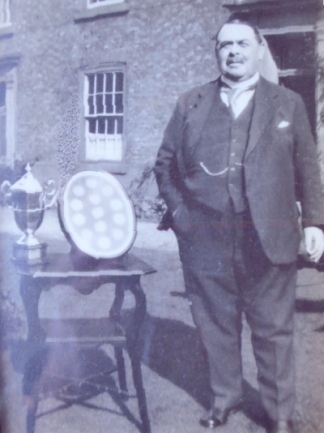 Fred’s fame was his Wem Gold Medal Ales, which came about when he entered the 1927 London Exhibition and won 1 Gold, 5 Silver and 7 Bronze medals, and a silver cup. 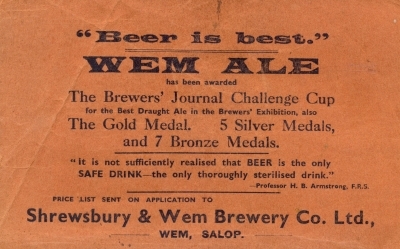 From then on, Wem Ales pub signs were in gold braid edging on a rectangular frame with a purple background and bold gold lettering saying “Wem Gold Medal Ales”. It all ended when Greenall Whitley took over the brewery. On the right is a Wem & Shrewsbury bottle possibly produced in Fred's time at the beer. The brewery name is actually cast into the glass. Fred was renowned for his liking his ale, and would sing ‘Oh Little Brown Jug how I love thee” when tanked up! He was also a dedicated bell ringer at Wem Parish Church. Below is a W&S advertisement in the Strongs Directory of Wem, 1941. Even then the brewery were boasting of Fred's achievement, 6 years after his death!